Although we're still waiting for spring to arrive at Patterson Park (and the rest of Maryland), we spotted some nice birds at the Saturday bird walk led by Dave Curson. While heading to the pond, we noted many Robins, Dark-eyed Juncos, and Ring-billed Gulls. All ages come to the Patterson Park Audubon walks. Bring your family next time! This juvenile Cooper's Hawk was very interested in a Song Sparrow. asleep in the branches right above us. This evening, 11 people showed up for a Chesapeake Audubon "Woodcock Watch" at Harford Memorial Gardens. In less than optimal viewing conditions, we found/heard 4 woodcocks which performed 5 flights, at least five that we heard. Of those 5 we only SAW one, but it was excellent and complex: a bird flew right over our heads, then zoomed up and circled. It was the first flight of the evening and visibility (despite the clouds) was good. 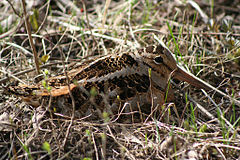 Observers were able to get their binos on the bird and see its plump body and long bill. The Oscar goes to that fellow--with some music awards going to the others. Thanks to the friendly group who showed up and stood patiently in the cold--always cold, these things, always cold, all that standing and waiting. Thanks to Kye Jenkins who drove 90 MPH on 95 to get there at the last minute and whose headlights from his red pickup might have been the catalyst needed to stir up the Oscar winner. Here we are listening for the peenting of the male Woodcock. We started hearing them about 610PM. Woodcocks can be found in wet thickets like these, and worms are a main part of their diet. Also known as "Timberdoodles", they are actually shorebirds in the same group as Snipe and Phalaropes, and are a popular game bird. During our 'watch' hundreds of Canada Geese flew over us to roost for the night in a distant farmfield, and as we left, two Barred Owls were hooting. Tim will hold another watch next year. Don't miss it!